North of Puerto Vallarta and Banderas Bay sits a stretch of small towns and undeveloped shoreline known as the Riviera Nayarit. Our tour will allow you to experience life in two small, magical towns of this blossoming area- San Pancho and Sayulita- before they reach their destiny as the next tourist mecca of the Mexican Pacific coastline. Our first stop is the Entre Amigos Community Center, to learn about the local efforts to recycle and make San Pancho a better place for everyone. Next, we will visit Mexicolate, a local artisanal chocolate factory. Come and witness the cacao beans transform into delicious, honey-sweetened treats; at the store, you will also find many sweets to eat and wear (natural skin care products made of cacao). You'll enjoy this part of the tour, even if you are not a chocoholic! 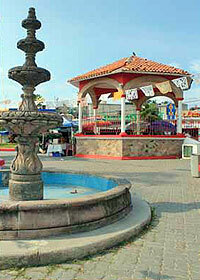 Then, we'll visit Sayulita, "the crown jewel" of Riviera Nayarit. A seaside surfer town with stunning natural beauty, ecotourism, and jungle. You will have time to sightsee, walk around and shop. Finally, we will visit Playa Los Muertos, literally "Beach of the Dead" since it sits next to Sayulita's Cemetery. You will have the option to visit a beach club, or just continue sightseeing this truly magical town. Runs: Tuesdays and Thursdays at 10:30 AM. Extra Cash for Souvenirs, Tips, Food, etc. Kids: All ages welcome. Kids prices apply to ages 2-12 years old. Kids under 2 years old are free.